Culture as a dimension in urban transformation is essential to building people-centred societies. Sustainable cities should be based in the right to the city and guarantee that cultural rights are at the centre of the construction of citizenship and peace in our societies. The UCLG Congress will explore the key role played by cities and local governments in shaping the future of people and living urban spaces. In Bogota, the Policy Dialogue on "Culture as a dimension in urban transformation" will provide key examples and tools on how to make culture a priority in the sustainable development of cities. 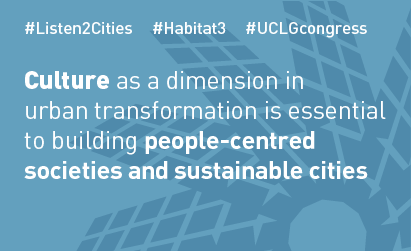 The UCLG Congress will also analyse the need for cities to be acknowledged in, and empowered by, the New Urban Agenda of Habitat III.